Writing has gained a lot of attention lately as a critical design skill. Many UX teams have caught on to the importance of voice and tone in interfaces, and are hiring writers in spades. I’ve spent my career in both product design and writing roles. When I was a content strategist at Facebook, design thinking was a key part of my writing process. Now as a product designer at Dropbox, I make use of my writing background every day. When my hobby was no longer my formal job, I was able to find new meaning in it. After switching careers to design, writing felt looser and airier to me. It was like reading for pleasure after years of following school curricula. When I was less precious about it all, I realized that I get more out of the act of writing than the finished work itself. It’s my natural way of thinking, ideating, and learning. In this post, I’ll discuss some ways I’ve found writing to be useful in my design process. And I’ll suggest lightweight, playful exercises to get the words flowing. I invite you to let go of your inhibitions and give your newest creative tool a spin. Design thinking is nonlinear. Writing can help harness your scattered ideas and make sense of them. Like organizing a closet, it’s a process that involves finding and compiling the right groupings of ideas. Put your favorite explorations on this shelf, or hang your open questions over there. Don’t underestimate the value in pausing to have that “conversation with yourself.” Make the time to cultivate intention and stay grounded in your process by documenting it. Use writing to synthesize and learn, form questions, and clarify your point of view. When you keep a regular writing cadence, you can also enhance your sense of progress over time. If you look at design as a journey, writing can be a catalyst to identifying steps forward — no matter how big or small. Try keeping a daily journal of your work. Each day, aim for 10 minutes of uninterrupted writing that’s for your eyes only. In my experience, this works best when done at the very beginning or end of each day. Describe a decision you recently made, or reason through a pending decision that’s hard to make. Pose big questions you’d like to explore next in your process, or explain solutions you’d like to prototype. Unpack learnings from user research. Frame up a conversation you’d like to have with a collaborator. Whatever’s on your mind, give yourself permission to listen and document it for 10 whole minutes. Designers often bring stories to our work through sketches. And according to HCI pioneer Bill Buxton, sketching is the defining act of design thinking. Sketches are quick, disposable artifacts we create to suggest, explore, provoke, and question. They’re central and unique to the way designers approach problem solving. What if we thought of story-writing as a form of sketching? Like sketching, writing is a fast and inexpensive way to capture ideas. Because they’re not visual, words have the added benefit of keeping solutions ambiguous. Stories create space for our imaginations to explore the human context of our work. They’re the lowest fidelity sketches you can create. Journalism is one of the most efficient forms of storytelling. Headlines and subheadlines boil down lengthy narratives to their essence. Many articles use the inverted pyramid structure to reveal information in easy-to-read chunks. Imagine yourself in a future world when your design has shipped. As you scroll through the news, you see a story about your work. What do the headline and subheadline say? Play with different wording and framing angles. If it’s helpful, continue the story by writing the article, or even the first few lines of it. Avoid discussing the finished design in detail. Focus instead on the impact that the design has made on people — the larger story that it tells. Think of this exercise as a verbal concept sketch to help clarify your vision and define a north star. When you’re finished, you can share your story with stakeholders to help gain alignment. Throw the words into a mockup of an article from your favorite news source for a fun discussion artifact. Designers love to solve problems, and we tend to use the tools we’re most familiar with to do so. For many of us, that’s pixels and code. We experiment with mocks and prototypes to see what works. Words are also tools that shape your design. Tinker with them. If you’re designing a button, think about how different verbs affect the tone of the experience. If you’re designing navigation, consider how different labels might influence navigation paths. If you’re lucky enough to work with a UX writer, tap on their shoulder to think through content together. It’s important to know when — and when not — to let words do the heavy lifting as you tackle design problems. For example, a tooltip that states the name of an icon button is a great way that words can support a design’s usability. A tooltip that explains what will happen when you click, tells you why you should click, and urges you to take action shouldn’t be a tooltip. Words shouldn’t solve functionality issues that the design itself could better address. When we plan interfaces, we often go broad and explore lots of visuals and interactions. Try the same technique for the words in your UI. (Bonus: Work with a UX writer if you have one on your team!). Let’s say you’re designing an onboarding flow that features a call to action. Try generating 10 different phrases you could use. How does each messaging choice change how the design makes you feel? How do they change the way you’d plan the design? If there’s one thing to take away from this post, it’s that the best way to get better at writing is to do it. Here are some of my favorite design-minded resources for better writing. 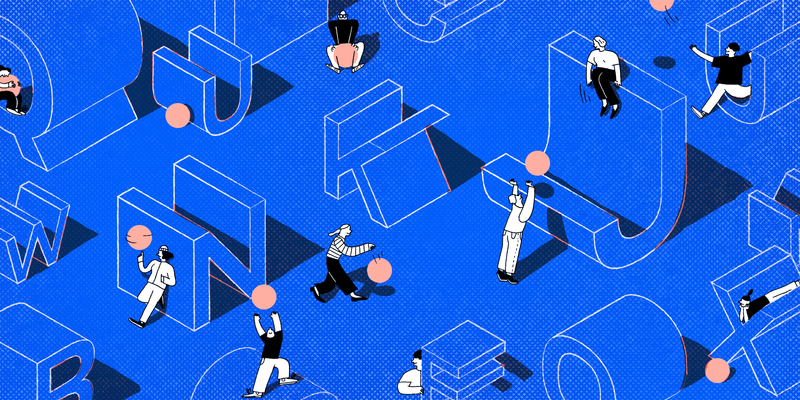 Want more from the Dropbox Design team? Follow our publication, Twitter, and Dribbble. Want to make magic together? We’re hiring! Designer, writer, and toddler-chaser. Currently unleashing creative energy @dropbox. Formerly @facebook, @thetileapp, @svaixd.